The Cornucopia Institute updated its popular infographics, which contrast the organic brands that are supporting the campaign in California to label genetically engineered foods (GMOs) with the organic brands that are part of a biotechnology/agribusiness campaign to keep consumers in the dark about genetically altered food patented and controlled by Monsanto and other biotechnology giants. Many more well-known independent organic brands have joined the fight on the side of California citizens and the “Yes on 37” campaign, pushing their funding total to over $4 million. This figure, however, still pales in comparison to the $35 million raised so far by corporate opponents. 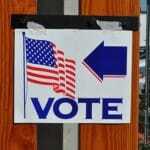 Recent surveys indicate that 60%-70% of California citizens support the ballot initiative Proposition 37. In addition to many new brands, including a number of cooperative and independent retailers, it is noteworthy that Applegate, a purveyor of natural and organic meat, recently contributed $50,000 to the Yes on 37 campaign. “Applegate officials, who had previously made contributions in support of labeling efforts in Washington, DC told us that our educational work at Cornucopia helped convince them that the fight for labeling in California was a unique opportunity that they needed to be a part of,” said Mark A. Kastel, Cornucopia’s Senior Farm Policy Analyst. 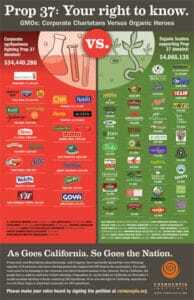 Applegate and Stonyfield previously appeared on Cornucopia’s Missing in Action infographic, which asks some of the major organic brands why their funding has been “conspicuous in its absence” during the Proposition 37 battle. Cornucopia says it applauds recent donations by Stonyfield Chairman Gary Hirshberg, and Applegate, and is quite pleased to move the logos of these well-known brands from its MIA infographic into the hero category of its main Proposition 37 brands scorecard. That leaves Whole Foods, Trader Joe’s, Hain Celestial, Newman’s Own and [newly added] Driscolls, the giant privately-owned berry producer, on the list of prominent players in the organic marketplace that, so far, are sitting this fight out. 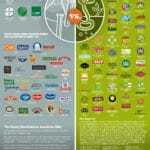 “Some of these companies are the largest and most profitable in the organic industry. We continue to believe that they should reevaluate their hesitancy to financially back an issue that is near and dear to the vast majority of their most dedicated customers,” Kastel added. Whole Foods’ stock is currently enjoying record high levels on Wall Street, but has also been the subject of mounting criticism. After being the focus of Cornucopia’s “Missing in Action” infographic, the retailer came out publicly with qualified support of Proposition 37. However, Whole Foods has not backed their position with a contribution to the Yes on 37 campaign. The giant retailer stated that it was their policy not to fund political campaigns. 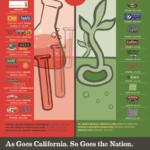 Several more brands that market organic products were added to the infographic’s “corporate charlatans” side when their corporate owners recently joined Monsanto and others in fighting Proposition 37. These brands include H.J. Heinz, Welch’s, Tree Top, S&W and Goya. Organic industry stakeholders are encouraged to visit The Cornucopia Institute’s website and sign a petition that will send a message to CEOs of organic companies asking them to join with other members of the organic community in securing the right to know which foods contain GMOs. Driscolls came under criticism over the past year when one of its executives, Carmela Beck, was appointed by USDA Secretary Tom Vilsack to serve on the National Organic Standards Board (NOSB). Although Ms. Beck was originally nominated by Driscolls to serve in a seat reserved for a handler (food processor), Vilsack appointed her to serve in a seat reserved by Congress for an “owner or operator” of an organic farm. Cornucopia’s hard-hitting investigative report, The Organic Watergate, highlighted by the New York Times’ own inquiry, focuses on how the USDA, during the Bush and Obama administrations, has subverted the intent of Congress by stacking the NOSB with corporate representatives. Driscolls’ Beck has already drawn scrutiny by organic watchdogs after voting for a number of controversial corporate-backed proposals adding questionable materials to the list of synthetics approved for use in organics. While many eminently qualified working organic farmers, some with a lifetime of experience, were passed over by Secretary Vilsack for the “farmer” seat on the NOSB, Driscolls was apparently added to the USDA’s list of certified organic farms just days before Beck’s appointment (as a token grower of nursery stock—supplying contractor farms—rather than producing strawberries or other produce).